Choosing the right paint color might be the most fun part of your painting project, but it is only the start to a professional job. Proper pre-paint prep is so vital it could be considered the most important consideration if you want your interior painting job to look professional. Professional painters will tell you that preparing the painting surface often takes more time than the painting itself does. In fact, interior paint preparation can make up 75% of the project! 1) Remove as much of the furniture as possible before painting. The room should be as empty as possible. This will save you a lot of cleanup at the end. Leaving furniture in the room is an invitation for an accident as well, especially if you leave smaller items in the room. It’s easy to trip over small objects when you are focusing on an area near the ceiling or someone distracts you. Who wants to have a can of paint slosh out all over the place? While spilling a can of paint isn’t life-threatening, slip and fall accidents can cause serious injuries. Even if you don’t hurt yourself, spilled paint is a waste of money and could result in a ruined carpet. That’s not a cheap replacement! Sometimes you have to leave larger items in the room. If you can’t take the furniture away, at least move everything to the center of the room. You are less likely to trip over a group of furniture. And it makes walls accessible. See Furniture Moving Tips for DIY Painters for ways to make this step easier. 2) Put down drop cloths. Paint has a way of finding its way to uncovered surfaces, no matter how careful you think you’re being. It’s better to be safe than sorry! Use drop cloths. For furniture, use lightweight plastic. It is flexible and can conform to any shape. It is also waterproof, which ensures that paint cannot soak through. On floors, butyl-backed drop cloths are best. Plastic, unless it is heavier, tends to bunch up and create a tripping hazard. Also, plastic has a way of moving. You may find a major section of your floor is no longer covered. If you try to put the plastic back in place, you may smear paint that tracked on the plastic all over the place. Canvas drop cloths absorb paint spatters but aren’t adequate protection for interior painting. 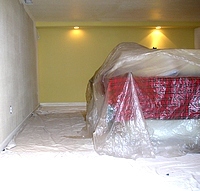 The paint can still soak through the cloth, damaging the carpet, fabric or hard surface below. 3) Remove pictures, clocks, and anything else you have hanging on your walls. This might seem obvious, but I have seen homes where I can tell that a painting was left on the wall when a new color of paint was put on the walls. Paint can fade around a painting, but it doesn’t change colors. I can only imagine the condition of the painting! You can leave nails in place if you plan to put everything back in the same place. Otherwise, remove the nails and fill the holes with spackling paste. 4) Clean all wall surfaces. Walls collect dust and dirt over time. Kitchen walls are especially prone to collecting grease. All this needs to be removed, or the paint may not adhere to the wall. Light soil can be removed with mild soap and a damp cloth. For heavily soiled or greasy areas, like the kitchen, use tri-sodium phosphate (TSP). It will quickly remove dirt and residues. If you prefer a green cleaner, undiluted Simple Green cuts grease effectively. Be sure to rinse well afterwards. Rinse the wall with clean water after scrubbing it down. If the water you are squeezing from the cloth looks dirty, it’s time to change to fresh water. Any residue left from soap, TSP or any other cleaning product, could react with the paint or prevent adhesion and could produce undesirable results. Then be sure to let the room air out and walls dry completely. If the walls are wet, it will thin the paint and require more coats to achieve full coverage. 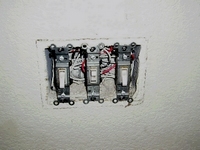 One of the most common causes of paint jobs looking unprofessional is paint on the switch plates and outlet covers. It’s also very common to see paint on the room’s light fixtures. Remove switch plates and outlet covers. Tape the screws to the back of the plate or screw them back into the switch or outlet. With tape there’s still a risk you might lose a screw, so putting the screw back into the switch or outlet is a better guarantee that the screws won’t get lost. Don’t be fooled by the name masking tape and think that will do the job. You need to get green or blue painter’s tape. It is a higher quality tape with enhanced water resistance. These basic preparation steps are the same, no matter what condition a room is in. If you pay attention to these six details, you will find it easier to achieve professional painting results. First repair the damage then lock out the red and black. Priming can seal up the walls so the red and black isn’t as much as an issue but you could also get a flat white, or other color tinted to your final finish color, then paint over it with your desired sheen. Basically you want to provide a clean sealed surface for the finish paint to minimize the coats that are needed. So, you have a couple options. Fix the damage, spot prime if needed and then paint. Or prime all of the walls to seal up the colors then paint.